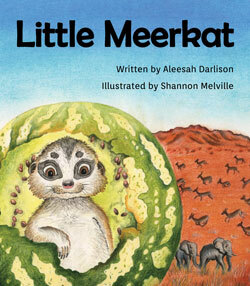 ‘Little Meerkat’ is a humorous, lively and adventurous picture book for ages 3-7. The main character, Little Meerkat, craves independence and adventure, so it’s just as well his extended family are there to guide and protect him! Aleesah chose to build her story around meerkats because they are loved and recognised the world over. This helps ensure children from all backgrounds, cultures and countries can connect with and learn from Little Meerkat’s story. Little Meerkat’s aspirations, bravery and mis-adventures bring humour to a great story, and provided the illustrator, Shannon Melville, with the opportunity to create truly beautiful, richly coloured illustrations.